 The Florida Potato Growers Association is a group of Florida potato farmers producing delicious new potatoes. We farm in the sunshine state and have farms from Hastings to Lake Wales. Potatoes are not grown from seeds. Potatoes are grown from other potatoes. We plant a whole, small potato or piece of a larger one to produce new plants with new potatoes. The first Florida potatoes are planted beginning in early October in South Florida and will continue to be planted until Late February or early March in North Florida.